These brand new multi surface cleaners from Herbaceous Scentz smell so good that you will want to clean more. Not only do they smell great, they clean without toxins. In fact, they are 100% natural! 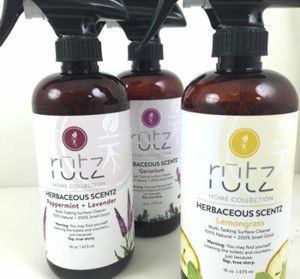 Herbaceous Scentz is a company founded right here in Pittsburgh, and we are excited to be one of the first few stores to carry their product. Use this cleaner on all hard surfaces (except mirrors). It’s an all natural cleaner, de-greaser, and disinfectant. For typical hard surface clean-up, just spritz and wipe. To disinfect and de-grease tough stains it is best to let sit for a few minutes as the cleaner goes to work. Safe to use on most kitchen and bath surfaces, even sealed granite, stainless steel, porcelain, laminate, quartz and other sealed hard surfaces. Stop by our Housewares Department to see our display, or visit Herbaceous Scentz facebook page here.